This suddenly makes me wonder if there's some art or grid paper-sprites of that "Giant Roll" boss that I just recently found out was supposed to be a thing, in the first game. No, I'm not making that up. 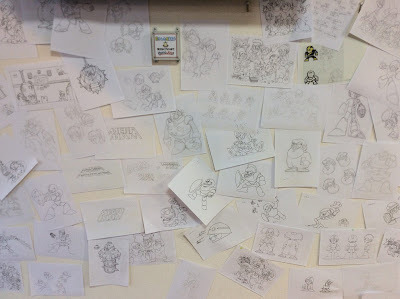 A giant version of Roll was supposed to be a Wily Castle boss. Any link to the info about this? And any new info about Bond Man in rockman 1? Or 8 robot masters in rockman 1 as well? Here ya go. Translated from a secret round-table meeting. Apparently, she was going to be kidnapped, too. But, uh, I'm not sure there would be any (official) art of that. I am that which I despise; the "fan theorist." Ugh, ha hah. There is even data for a Wily 5 in Mega Man 1. And it's layout is actually very similar to Mega Man 2's Wily 6. According to the scroll data in Elec Man's stage, it was going to be 10 screens long. The scroll data is the following: 40 27 00 which translates to Down 1, Right 8, Boss. Unfortunately, screen data for the first 4 rooms is missing because those rooms are used in Elec Man's stage for 3 rooms after the room with the Magnet Beam in it. The 5th Wily level is accessable by changing the initial level in the stage select at 1B6FF in the US version of the game from 00 to 0A, and pressing start on the stage select screen (ignoring the glitchyness of course). 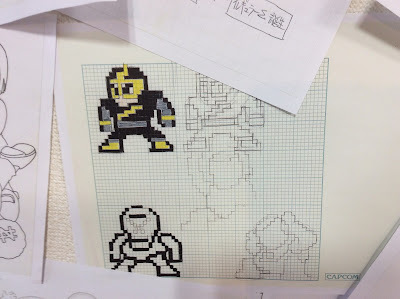 However, some hacking is required because you can't go too far, since the first 4 rooms were overwritten for Elec Man's stage, so those rooms have to be changed a bit. There is no enemy data for the level. Entering Wily 5's boss room loads some code of the Wily Machine to move the background, but no boss is loaded. Wily 5 uses the title screen's tileset, and changing the PPU data for the level also affects the title screen. The level seems to have used a unique tileset at some point, but is no longer in the game. I"ve read about that too. Love it! Absolutely beautiful. Thanks for sharing! Great stuff. But from the look of it, even these folks couldn't come up with more Sentinel Rockman figures than just the .Exe's. I'd say that's a good sign that they need to print off more of the elusive, and desirable figures. These are great. Thanks for taking the time to get these snapshots, Tony. A lot of fascinating stuff. I love the one with the sprite maps.... That blow my mind! Sweet. Love Mega Man concept art. This Tony guy has my thanks.